Ice Fire Poly/Spandex Figure Skating Pants - Skate & Ornament. The Ice Fire Figure Skating Pants are made of high performance fabric that is soft to touch on the inside and quick drying on the outside. 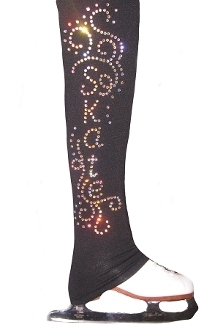 Features a "Skate & Ornament" rhinestone design down one leg. These pants are a perfect match with Ice Skating Jacket "Skate & Ornament". Over 400 superior quality rhinestones make them unbelievable shiny! Choose from several colors in Child XS - Adult L. Click on images to view sizing chart.